Today I welcome Ava Hayden to the blog to answer a few questions for Author Interview³. • I wrote my first MM romance (His Fallow Heart) for Dreamspinner’s Daily Dose because I had just finished a lot of research on Alberta farming for a YA novel I was working on, and I got stuck on the novel and needed a change of pace. Robert Heinlein. Gillian Bradshaw. Andrew Vachss. • I would *like* to write at a local coffee shop that just opened in my neighbourhood but only when it doesn’t entail walking there in -20C or slogging through slushy snow on warmer days. Maybe later this spring. • Never worry about how old you are (or aren’t). Age is irrelevant. • Find some like-minded people (Facebook group, real life group, etc.). • Just do it. Start. Write. • Finish the current round of rewrites on a YA novel. • Start (and hopefully finish) an MM romantic suspense novel. 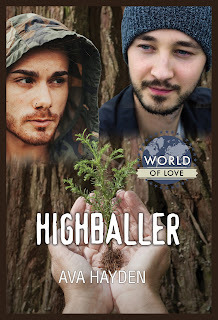 My Dreamspinner Press World of Love series entry Highballer takes place in Alberta in a tree planting camp. It came out in October 2017.